A survey by networking community InterNations has ranked Spain 7th-best in the world for foreigners according to criteria including quality of life, finance, ease of settling in and work-life balance. The 'Expat Insider' report was based on the average of a number of sub-indices, including the General Quality of Life Index, Ease of Settling In Index, Working Abroad Index, Family Life Index and the Personal Finance Index. Respondents were also asked, "How satisfied are you with life abroad in general? ", which was weighted heavily in the overall country ranking. 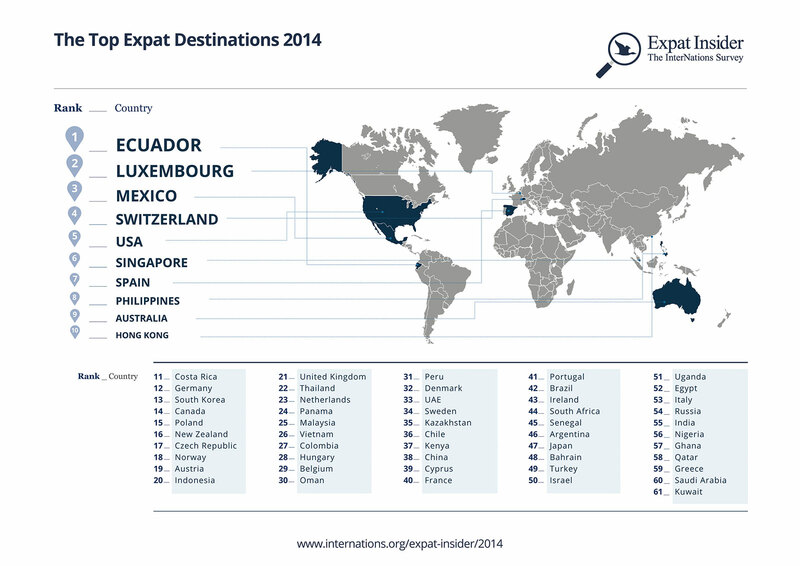 Ecuador was the surprise winner, boosted by expats' high levels of satisfaction with their own personal financial situation there, followed by Luxembourg – which scored highly on career opportunities – and Mexico. The worst countries to live, according to the report, were Greece, Saudi Arabia and Kuwait. Spain scored highly on factors such as personal safety (94 percent satisfaction) and political stability (79 per cent considered it stable), well above the worldwide averages of 85 per cent and 46 percent respectively. It topped the charts in terms of making newcomers feel welcome (82 percent positive) but was rated only 11th in terms of friendliness. This may explain why just 59 percent responded positively when asked if it was easy to make friends in Spain. Only 5 percent of expats reported an unfriendly attitude towards foreign residents, far below the global average of 13%. Spain was rated 23rd in the world for ease of linguistic integration but 71 percent of expats said it was easy to learn Spanish and 79 percent claimed they could speak it. The country's medical care and infrastructure for transport and travel were rated highly but Spain was in the bottom five globally for expat earnings, when compared with previous income. In the Working Abroad category overall, Spain was ranked a dismal 55th out of 61. Overall, some 45 percent of expats in Spain said that they were satisfied with life. 34 percent described themselves as "completely satisfied" with their social lives and less than 1 percent commented negatively on the local weather. Family friendliness scored highly. Only 1 percent of respondents reported having experienced an unfriendly attitude towards families with children and only 2% of participants in Spain viewed the state of children’s health and safety to be in danger. According to InterNations, "This deviates heavily from the 11% of respondents globally who believe this to be the case in their countries of residence." 19 percent of expats said that they had moved to Spain for 'better quality of life' and were seemingly rewarded: Spain topped all other countries except Switzerland on the Quality of Life index.